Hot-and-sour soup is one of my favorites. Unfortunately, it’s not easy to find versions of it with no pork when ordering at restaurants. There are plenty of recipes for vegetarian versions of the soup to make at home, but I was particularly drawn to this mushroom-forward take. This is from Every Grain of Rice by Fuchsia Dunlop, and since I usually mention when I’ve received copies of books I want to point out that this is one I purchased. I was browsing the cookbook section at the bookstore which I can spend hours doing, and when I started looking through this one I lost count of how many dishes I wanted to run home and try. There’s a rainbow of sticky note flags marking pages in this book. The dishes are true to authentic Chinese cooking, but they’ve been made very accessible to home cooks in the West. Not too many ingredients are hard to find, and often those are optional. I’ve made the Tiger Salad which is a mix of cucumber, cilantro, green chiles, Chinkiang vinegar, and sesame oil. I made the Salt-and-Pepper Squid and added Shrimp lightly dusted in potato starch, fried, and topped with stir-fried garlic, green onion, and red chile. I tried the Sweet and Spicy Cold Noodles with sesame paste, sesame seeds, chile oil, and topped with shredded chicken. Everything has been outstanding. 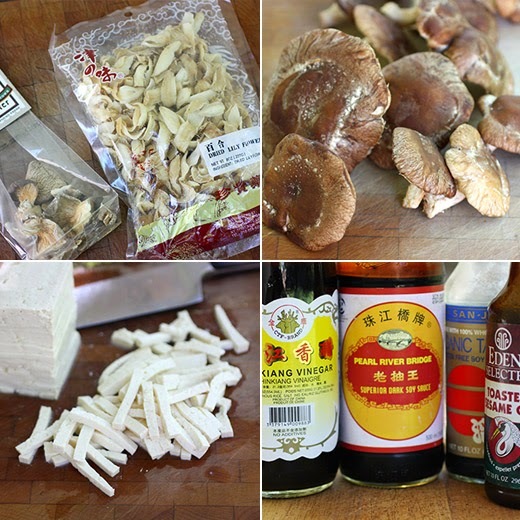 I can’t wait to take a stab at Dumplings in Chile Oil Sauce, the Stir-Fried Oyster Mushrooms with Chicken, and the wonderfully simple Silken Tofu with Avocado. This book hasn’t spent much time on the shelf and probably won’t. Now, back to this soup I started talking about. It’s described as subtler than the hot and sour soups from Chinese restaurants in the West. The sour comes from Chinkiang vinegar, and the hot was to be delivered by white pepper. I have a preference for black pepper and crushed red pepper, so I made a very unauthentic change to the dish by using those instead. However, I did seek out dried day lily flowers which were an optional item in the ingredient list. The recipe includes both fresh and dried mushrooms. We usually have a pretty good selection of types of fresh mushrooms at our local grocery stores, but on the day I was shopping for this dish shitakes were available but no oyster or enoki. I bought dried oyster mushrooms instead. The dried mushrooms and the dried day lily flowers were to soak in hot water for an hour before using. Meanwhile, I started cutting the ginger into tiny slivers. The fresh mushroom caps were also cut thinly, and the tofu was cut into thin shapes similar in size to the mushroom pieces. To start the cooking, oil was heated in a wok and ginger was sizzled until fragrant. The dried mushrooms which had been sliced thinly as well along with the fresh mushrooms and lily flowers were added next. The mixture was allowed to cook until the mushrooms were almost cooked through, and then, warm chicken stock was added and brought to a boil. The tofu was added and carefully stirred to prevent breaking it too much. Light and dark soy sauce were added, and after a short simmer, the vinegar and pepper were added. Off the heat, sesame oil was stirred into the soup, and it was topped with green onions. This was a fantastic hot-and-sour soup or sour-and-hot soup. The fresh and dried mushrooms gave it great flavor, and there was a nice mix of textures with the lily flowers and tofu. It lacked the shreds of cooked egg that often appear in a hot-and-sour soup, but there was enough going on here that I didn’t miss them. I’d like to just keep cooking page after page of this book, so a feast of a dinner party might be in order. Lisa I LOVE these kinds of dishes too, but to find all the ingredients here on cape cod is impossible. Once in a while I take a trip to Boston to Chinatown to stock up. This soup is the best for those days when it's 20 degrees or below. So comforting and soul-uplifting! A fabulous soup. No doubt this soup is very yummy! It looks warming and very tasty! Just without the mushrooms but no worries there! The description of the Sour and Hot Mushroom Soup is wonderful! Your compelling review of "Every Grain of Rice" will have me seeking out this cookbook! This soup looks delicious and I'm going to check out this cookbook for sure! Thanks! Reading your description had my mouth watering, Lisa! Mushrooms are just "meaty" enough that I could see this working incredibly well. Bravo! WOW! Your soup looks gorgeous! I'm dying to taste it! Fuchsia Dunlop is brilliant -- I have her first two books, but not this one. And I know how good her soup is -- I've made hot and sour soup taking bits and pieces from two of her recipes. Super post. ;-) Thanks. Agreed! 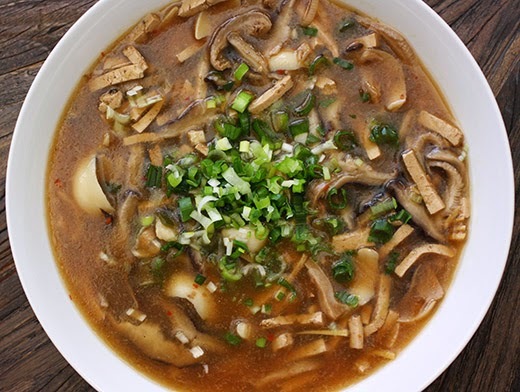 The mix of fresh and dried mushrooms give this soup great color and flavor. I am crazy about all soups right now, and this one doesn't look like an exception. This looks so good! 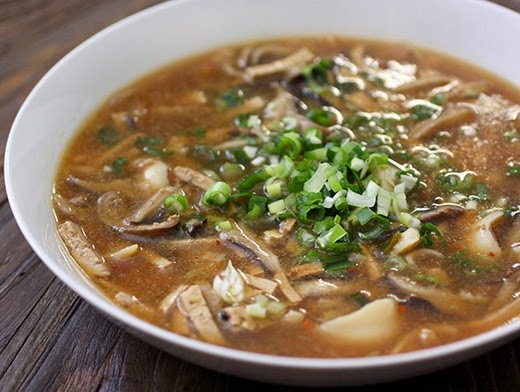 I'm a big fan of hot and sour soup and this recipe sounds like one I would really enjoy. I'm a huge fan of this soup, but I've never tried making it at home. Looks like there's another cookbook I need to add to my collection!